Charles E. Brooks may not be a name recognized by many people outside the area around Cedar Grove, WV where he was born and raised or even among many members of the West Virginia Black Lung Association, but miners across the Nation owe him a debt of gratitude. Charlie or Brooks to his friends began his mining career in 1941 and was a Member of UMWA Local Union 2236, the same Local Union as President Roberts. During his time with the Union, Brooks’ dedication, determination and compassion for his fellow miners would help create a movement that demanded coal operators and the government take notice and address the unhealthy conditions miners were forced to work in. In his early career, Brooks, like all miners at the time, worked in the confined areas of underground coal mines without regulations requiring adequate ventilation or limiting their exposure to coal mine dust. The situation was so dangerous miners could not see more than a few feet through the thick float coal dust that was suspended in the mine atmosphere. And while dust explosions killed thousands of miners, it ultimately claimed tens of thousands of miners who suffocated from Pneumoconiosis (Black Lung Disease). During the mid-1960’s UMWA miners, mostly from the southern West Virginia coal fields, became increasingly vocal in demanding the state government take action to protect miners from excessive coal mine dust and compensate miners who had contracted Black Lung Disease. Brooks Risked Everything to fight for Black Lung Benefits In 1968, Brooks mortgaged his home to raise money and hire former State Senator Paul Kaufman, to lobby the West Virginia legislature to pass Black Lung legislation. 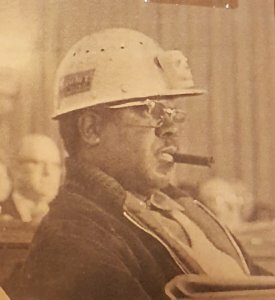 Later that year the West Virginia Black Lung Association was founded and Charles E. Brooks, an African American coal miner from Cedar Grove, was elected its first President. On March 11, 1969 the Governor of West Virginia signed the first Black Lung legislation in the history of the United States. Later that year, President Richard Nixon would sign the Coal Mine Health and Safety Act of 1969 (the Mine Act). Thanks to the efforts of Charles E. Brooks and his fellow miners, the Mine Act would establish coal dust standards in underground mines and recognize Black Lung Disease as a compensable occupational illness.